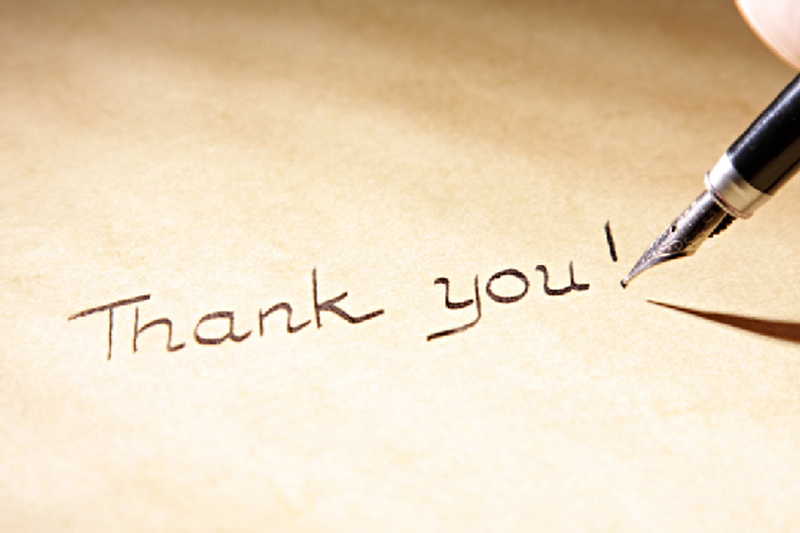 Part 2: Why Should You Write a Thank You Note for Interview? Not sending in a thank you note for interview to the recruiter as a follow-up is among the reasons for not getting a job. Many experts believe that failing to send a thank you letter decreases your chances of landing a job even if you had all the qualifications required for the job and your interview had gone well, too. A thank you note for interview to the hiring manager as a follow up shows that you are highly interested in getting the job. It also is a polite way of appreciating the interviewer for taking out the time for interviewing you. The Ladders which is an online job-matching portal conducted a survey which revealed that every 3 out of 4 hiring managers gave importance to thank you letters and took the matter into consideration when making hiring decisions. I would like to thank you for the chance to meet with you and go over the details of the secretarial position available at your office. The discussion we had regarding the duties of the position not only enlightened me about the obligations of the job but also gave me an idea about XYZ Company as well. I learned a great deal about the position from the additional info that was given to me by John and Lisa. I have complete confidence that my strong people skills and ability to work in a team are going to benefit your organization. I have full command over all the software programs that are currently being used in your office and my customer service background makes me an ideal choice for this position. The meeting with the office staff was a pleasurable experience for me. The working environment at your company is definitely suitable for me, as I like working in a company where teamwork and efficiency are given the highest importance. It would be an honor for me to become a part of your organization. I will contact you to inquire about the decision you have made in a week. Sincerely, thank you again for considering my application and taking out the time to conduct my interview. I would like to thank you for interviewing me this afternoon. I am enclosing the resume that you asked for along with this letter. The editing position available at your company is highly appropriate for my qualifications. My experience in writing for travel related topics makes me the ideal person for this job. I would also like to tell you that I am very deadline oriented and like completing my work on time. I am highly grateful to you for taking out the time to talk with me and will wait eagerly for your reply. Thank you for talking to me on the phone regarding the accounting position a few days back. I am certain that the organizational skills I possess would land me a job anywhere including Company X. A thank you note makes you stand out from the rest of the applicants who attend the interview since not many candidates take out the time to write thank you notes these days. Thank you notes show the interviewing person the writing prowess you have. When working for the company, you would have to communicate with your managers and clients in written form and a well-written thank you note can tell the hiring manager that you possess that skill. A thank you note demonstrates that you have a habit of following up after a meeting. It is a quality that many employers want to have in their employees. Thank Everyone: Don’t only thank the interviewer in your letter. Thank everyone who was involved in the process so that you develop a good working relationship with them. Include Things You Forgot During Your Interview: If you missed out on anything during your interview, then the thank you note is your opportunity to say it. Basics of a Thank You Letter: Whether you are sending your thank you letter in typed or handwritten form, it must contain words of appreciation for the interviewer, the interest you have in getting the job, your skills and credentials and a thank you in the end. Review What You Have Written: Avoid the chance of making any spelling mistakes in your thank you letter by first reviewing it yourself and then ask somebody to review it for you. Send Thank You Notes by Email: Sending in an email thank you note in addition to a written thank your note is also considered a good thing as the employers love receiving them as well.